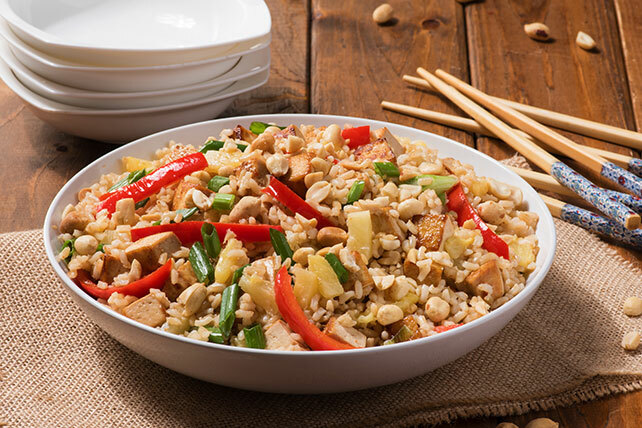 Put sweet and savory deliciousness on the menu with Thai Peanut-Pineapple Fried Rice. Thai Peanut-Pineapple Fried Rice is ready to eat in 35 minutes. Pour teriyaki sauce over tofu in shallow dish. Refrigerate 10 min. Drain tofu, reserving the teriyaki sauce. Heat oil in large skillet on medium heat. Add tofu; cook 3 to 4 min. or until golden brown on all sides, stirring occasionally. Remove tofu from skillet. Add peppers to skillet; cook and stir 2 min. Add onions; cook and stir 1 min. Add rice and pineapple; mix lightly. Cook 2 to 3 min. or until heated through, stirring frequently. Add nuts, tofu and reserved teriyaki sauce; mix lightly. Cook 2 to 3 min. or until heated through, stirring occasionally. Stir 1/2 cup chopped fresh basil into rice mixture in skillet along with the nuts, tofu and reserved teriyaki sauce. Or, stir 1/2 tsp. crushed red pepper into the cooked vegetable mixture in skillet along with the rice and pineapple.